What a fun layout to document your salon visit! Beautiful layout! I just love the backgrounds from that set. The background colours really compliment the photo. Nicely done! Nice use of these elements. Thank you for sharing your art! Those new papers are so chic. Lovely layout! Your layout is beautiful; love the papers you used. 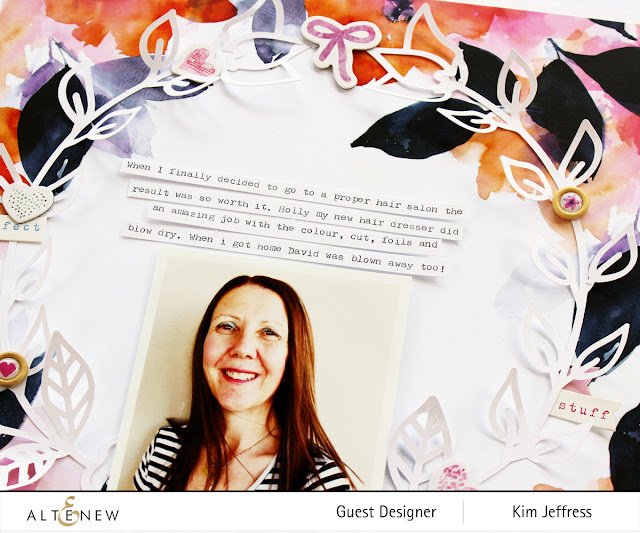 wonderful layout, Kim - love that background paper you used! The paper you used is beautiful and love the layout you did. Beautiful - love your layout and esp the background!!! Great project and layout. Happy anniversary Altenew! Lovely layout! The circle wreath is perfect with the background paper. Very pretty layout. The circle of flowers in this paper makes a lovely frame. nice layout. Happy 5th Anniversary Altenew. I’m so loving all the beautiful inspiration here! Your layout inspired me to try to make one too :) Thank you! This is such a fun LO!! TFS & inspiring. I'm hoping this collection will be back in stock soon! Love that you focused your layout on you, beautiful work! Such a pretty page Kim. Great picture! Love the pretty wreath and the sweet embellishments... awesome background paper! Happy Anniversary to Altanew! Such a beautiful layout! The colors are gorgeous! 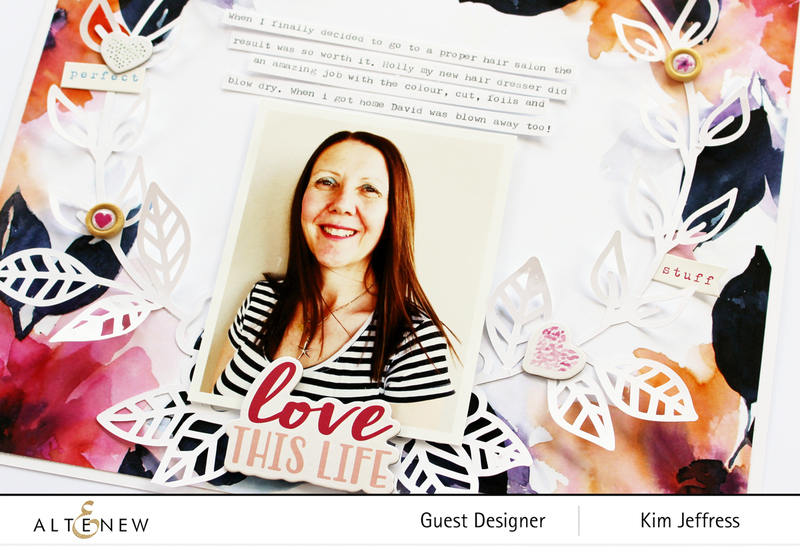 What a great fun, happy layout, Kim! Great wreath! Thanks so much for sharing and for your wonderful inspiration! Lovely layout. Happy 5th Birthday Altenew! Great layout, this kit is gorgeous! Great layout! Happy 5th Birthday Altenew! Beautiful watercolor effects!!! GREAT layout! Happy 5th Birthday Altenew! Beautiful layout! Thanks for the inspiration. Happy 5th Al! Love the leaf wreath around the photo. Nice job! I love the circular pattern you used. It makes the layout focused. Beautiful layout, awesome job. Thanks for sharing your creativity! Love that you chose a circular design with such beautiful colors!!! LOVE the Altenew pattern paper! !Happy Birthday Altenew! Great layout and I love the background with these cuts! So pretty and fun! Great layout! Love that paper and the shape it gave your layout. Great job Kim ,Happy Anniversary Altenew !!!! 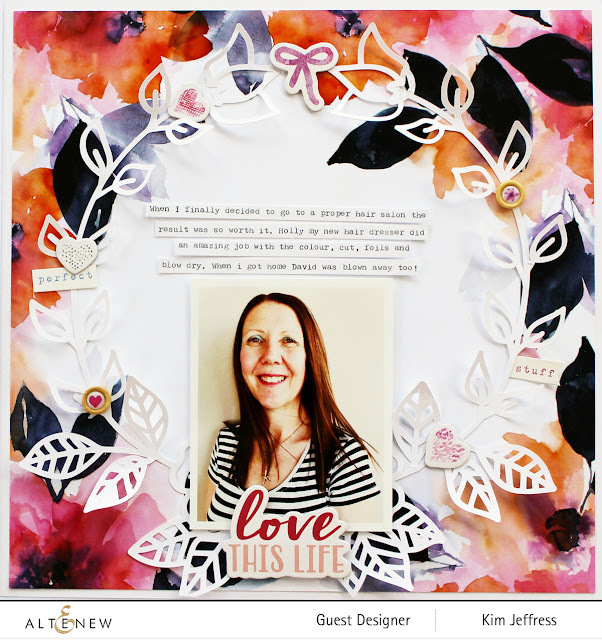 Awesome page Kim, I love this new scrapbook kit, the colours are so vibrant. A very nice layout and I love the design and colors. Great layout! Love the overlaid white leaves over the pretty flowers. Kim, your page turned out beautiful....I too am a big fan of that beautiful floral paper. I do like the way you added your circular cut file frame...it turned out perfect....and Nice photo of you also...thank you so much my dear for sharing your pretty work. Love your beautiful layout, Kim! I love the white wreath on that gorgeous floral background! It sets off your picture in such a pretty way! What a happy layout and I loved the story it told. I have frizzy hair and any time someone can make the color and the blow out beautiful it makes me feel that way. Now, back to the layout.........it really is lovely. Oo, the white wreath on top of the bright flowers is such a fun look. And what a great photo. Thanks for sharing with us! Pretty details and colors! 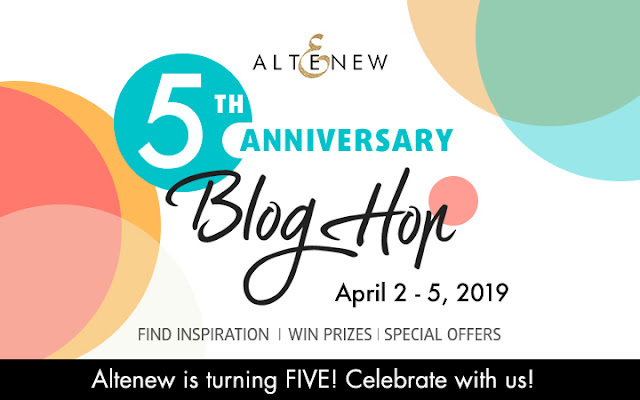 Thanks for joining in on Altenew's 5th Anniversary blog hop! Their scrapbook papers are just gorgeous. Thanks for sharing such a pretty page. It's amazing how a good hair cut & colour can make you feel isn't it? Good for you for treating yourself! Love the gorgeous colours in rhe floral paper. Adding that whie wreath shape around your picture was a wonderful idea too. Thanks! WOnderful layout. My "wish" list is growing as I see all the beautiful things everyone has created in this blog hop. Thanks for sharing and inspiring. Wonderful layout! I love the way the vibrant blooms and leaves frame the center. Beautiful colours you used too! Wonderful job with this page. You made an amazing layout! Such a beautiful layout! The colors are so vibrant and love that cutfile! And your photo! Lovely! Thanks for inspiring us during Altenew's 5th Anniversary celebration! I love seeing layouts on a hop like this! Happy Birthday Altenew and many more! Lovely layout and colors! Lovely layout and hair too. Thanks for sharing and Happy Anniversary Altenew! Such a pretty layout! That wreath works perfectly around the inside of the floral paper. The colors are a great compliment to your beautiful hair! This is a happy page, in great colours. Beautiful layout ! Very pretty page, love the colours! I love wreaths, and this large one is perfect with the pretty paper behind it! Beautiful layout. Great colors and flowers. Thanks for the inspiration! I like the wreath layout you used on your page, very petty. Love that cut file! It looks great with this kit. Wonderful layout! LOVE the colours, navy, pink & orange - WOW - LOVE your design with the white leafy frame too! Beautiful layout. Love the bold colours and the gorgeous white frame. Love your pretty layout! So bright and fun! Gorgeous layout! The colours are fabulous! Beautiful layout! Love the wreath! Beautiful layout!! I love the colors. Thank you for sharing. What a great layout! The paper DOES look like a wreath and your addition of the paper leaves is the perfect touch- yet it stlll lets me enjoy the background flowers. Beautiful design! Happy Birthday, Altenew! Such a pretty layout! I like the design and the cut file you added to it! Thank you so much for sharing! Happy Anniversary Altenew! So pretty, and I love that the circle of flowers comes slightly off the page to give it a 3D look! So pretty. Love the wreath design. Lovely layout Kim! Thanks for sharing ❤. great way to use that gorgeous paper! Great use of the paper to surround the pix and make the pix the focal point! And here I thought that doing a layout is hard, not if you use pattern paper. You're an encouragement to start doing my scrapbook pages because I have hundreds of photos. Love your layout and the journalling, which I feel is so important because it's about history. Thank you for posting.